Stay Hydrated with Fruit Infused Water. Summer is nearing and we need plenty of hydration. But, how do we make drinking plain H2O interesting? How about making infused water? 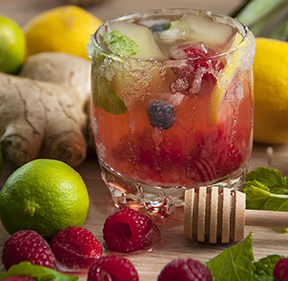 Colorful fruit infusions will make you want to drink more without the extra calories. Plus, It’s good for you. Choose organic fruits and vegetables for a better taste. Use filtered cold water rather than hot water. Heat will compromise the nutrients in your produce. A glass container is always better for the best flavor. Apples, take longer to infuse, so cut them into very thin slices. Crush herb and flowers and wrap in a cheesecloth so all the stray bits don’t float in the infusion. Add very little honey for sweetness. Too much will spoil the drink. Drink within a few hours. Enjoy!